Based on impressive fuel consumption and performance results from the Volvo Penta engines installed in a new-construction pushboat, the operator decided to repower one of its older vessels with the same D16 engine package. When Volvo Penta supplied the main propulsion system for the M/V Ted Kayser, a new 60-foot pushboat christened at the end of 2012, it was Allemand Industries, Inc., the Volvo Penta Regional Power Center in Harvey, LA, that oversaw the installation. Designed by Entech & Associates of Houma and constructed by Eymard Marine Construction and Repair of Harvey, M/V Ted Kayser today operates with two Volvo Penta D16 engines, each providing continuous 650 hp at 1800 RPM. The engines drive a pair of Rolls-Royce four-bladed stainless steel propellers through Twin Disc MGX5222 5.04:1 marine gears. Since the vessel was commissioned, it has put more than 6,000 hours of service on the engines. Documented average fuel consumption runs between 4.01-4.38 gallons per hour per engine. According to Volvo Penta, and compared to other vessels performing the same work, the pushboat consumes about 180-200 fewer gallons daily, resulting in fuel savings of about $1,000 per day. The annual savings are easy to calculate. For its part, Allemand Industries has been dedicated to the marine and industrial engine service-and-repair business for the last 30 years. Established in 1981 by the Allemand family, the firm maintains deep and long lasting business relationship with their customers. 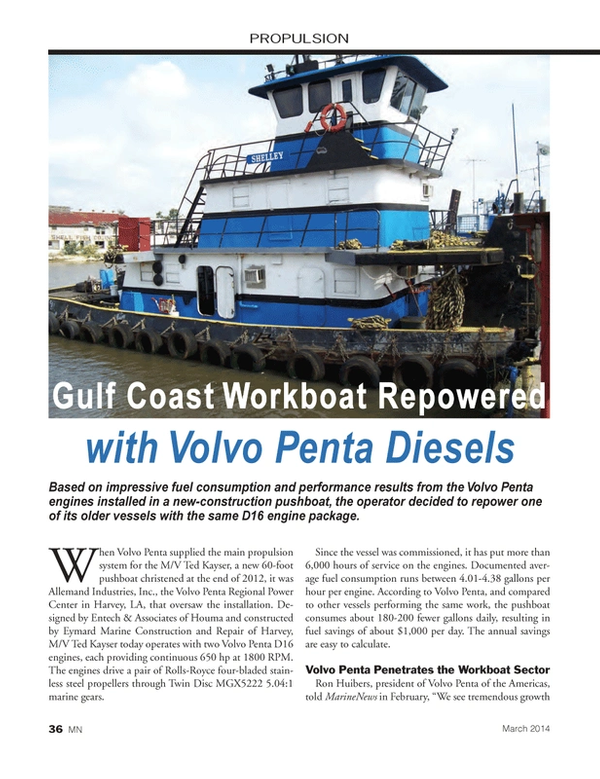 As a Power Center for Volvo Penta marine commercial engines, Allemand supports the states of Alabama, Arkansas, Louisiana, Mississippi, as well as the Gulf Coast and Red River Valley areas of Texas. The D16 is an inline six-cylinder with Volvo Penta’s Electronic Vessel Control (EVC) technology. The engine features a robust block with ladder frame, high-pressure unit injector system, four valves per cylinder, twin-entry turbo and charge air cooler. The heat exchanger is designed for reduced charge-air cooling temperature, which in combination with the injection system and Engine Management System further improves performance and drivability. According to Volvo Penta, this results in a very smooth running engine with world-class performance, low fuel consumption and reduced emissions. As a result of the positive experience with Volvo Penta engine packages supplied by Allemand Industries, the same operator decided to retrofit a second vessel, M/V Shelley (pictured on previous page), with the same D16 engine packages. Beyond this, Allemand reports that the customer is looking at other vessels in the fleet to repower, as well. Originally built in 1980, M/V Shelley is a 60 foot LOA, 26 foot beam workboat that draws 9.5 feet in draft. Allemand Industries removed the two existing Diesels, and installed two Volvo Penta D16C-CMH engines, with Twin Disc MGX5222 marine transmissions, ratio 5.04:1, packaged at the Allemand shop. Volvo Penta Americas President Huibers says that Volvo Penta is making inroads in the U.S. workboat market. He pointed, as another example, to Zimco Marine, a commercial fishing fleet based in Brownsville, Texas. Zimco turned to Volvo Penta to repower two of its shrimp boats with D13 MH engines. Since July, the repowered vessels have put in more than 1,000 hours and have already recorded both financial and performance benefits. The company calculates its fuel consumption reduction at more than 30 percent over its original engine package – a savings of nearly $40,000 per year, per engine. The shrimp boat captains say they can feel a difference at the helm, noting that the D13 works harder and more efficiently at lower engine speeds. The Volvo engine was also found to have better acceleration and more torque at lower RPM — in addition to being quieter, lighter and smaller. With all of these advantages in mind, the company has already placed an order through the local Volvo Penta dealer, Palmer Power in Houston, for replacement engines for another two boats. It hasn’t been that long since Volvo Penta actively began to target the domestic workboat markets with their proven engine designs. Long successful overseas in similar commercial markets and best known here in the high end recreational markets, it also likely won’t be long until the Volvo Penta brand makes its mark on the U.S. Gulf Coast, and beyond. When it does, the D16 inline six-cylinder with Volvo Penta’s Electronic Vessel Control (EVC) technology will no doubt be a big part of that equation.